Our range of products include shave ice / ice gola cart. 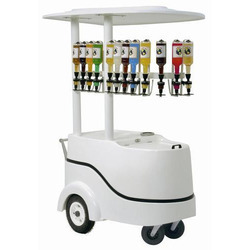 We manufacture exclusive Snow Ice Cart made from high-quality material and is designed to add exclusivity to your brand and efficiency to your operations. The Ice Gola Cart is provided with a fiberglass canopy and a Bar-style bottle rack which can hold up to 12 syrup bottles. Up to 60 kgs of Ice cubes can be stored in the Poly Urethane Foam Insulated chamber that can keep the Ice for up to 10 hours from melting. Either electric or manual operated Ice Gola Cart can be provided as per customer’s requirement. Heavy Duty tires ensure easy mobility. Looking for Shave Ice or Ice Gola Cart ?